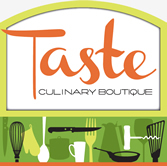 Taste Culinary Boutique is now open at Gardner Village, and you have the chance to attend one of their cooking classes of your choosing FOR FREE! Read all about the "Warm Winter Soups" Class I took! It was a lot of fun! View a list of their upcoming classes. Referring others. For each person that enters and mentions you referred them, you get an extra entry. If you have any questions on this contest, email contact@enjoyutah.org.